The exhibition sector in the Asia/Pacific and Middle East/Africa regions have seen the highest levels of gross turnover in the last five years. The healthy outlook comes from the latest Global Exhibition Industry Barometer report by UFI, the Global Association for the Exhibition Industry. The data indicates that, for each period between mid-2018 and the end of 2019, a majority of companies from all four global regions indicate gross turnover increases. However in the Americas and Europe, regions that recorded very high increases in the recent editions of the barometer, fewer companies now expect as strong growth as before. Around the world, economic concerns, at national or global level, remain the top business issues for industry leaders, followed by competition from within the industry, internal challenges and digitisation. 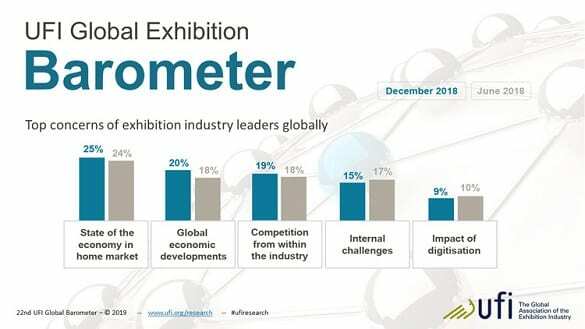 A large majority of companies are planning new activities either in the classic range of exhibition industry activities (venue/organiser/services), or outside of the current product portfolios, or in both areas. Also, a growing number of companies are looking to expand into new geographical markets all around the world. The report also points out the need to develop the “entertainment” component of exhibitions, for the younger attendees. New ways to deliver talks and presentations, new technology such as Virtual Reality and informal networking were all priorities for both attendees and organisers. 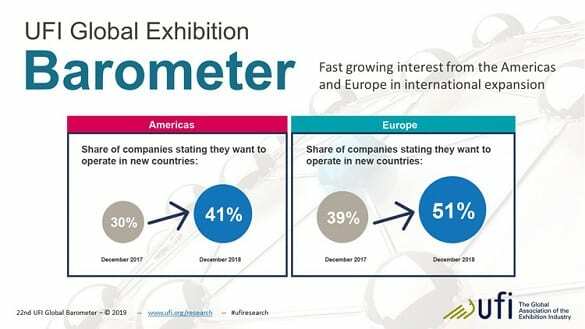 “The data shows that the exhibition industry is set to continue to grow globally as a whole, but foresees obstacles in various markets and regions,” said Kai Hattendorf, UFI managing director and CEO. “Ever more companies are focused on expanding their geographical footprint, to counter potential risks in the economic development in their respective home markets – most notably companies based in mature markets.